If you missed part 1 of this piece, I’m going to warn you, part 2 isn’t going to make a whole lot of sense! Check it out here. Lost, confused and increasingly at odds with their friends, family, team and band mates, we rejoin our two heroes before the biggest changes in both of their lives. It often takes a big event to spark change, and for both Bruce Springsteen and Michael Jordan, this was no different. Springsteen’s marriage to Julianne Phillips provided much of the material for Tunnel of Love, but his divorce from her seemed to give the Boss pause. He had found what he thought was happiness with his new partner Patti Scialfa but he realized that he didn’t really know how to be happy. Springsteen famously said ‘the first time I looked in the mirror and liked what I saw was the first day I saw myself with a guitar in my hand’. The problem now was what to do when the guitar wasn’t enough. Springsteen dissolved the E-Street Band, moved from Jersey to L.A. and disappeared from the public eye for several years, popping up at various charity and fundraising activities but for the most part keeping to himself. Jordan’s change was far different. The tragic and senseless murder of his father in North Carolina in 1993 left him lost. He still had his family, he still had his money but Jordan had lost his passion for basketball. He had won everything there was to win and now he couldn’t share it with the person who meant the most, the person who helped him get there. He decided to honour his father by retiring from basketball at age 31 and attempting to become a professional baseball player, something his father had always dreamed for him. Jordan’s confidence was so high that there was never a doubt in his mind that he could succeed. Rather than playing baseball, Springsteen decided to make new music. Instead of the stark sounds of his quieter records or the soaring melodies of his earlier work, Springsteen went with straight ahead rock and roll. He did it with the albums Lucky Town and Human Touch, released simultaneously in 1992. He did it without the E-Street Band. Both albums went multi-platinum but are considered massive disappointments by fans, especially Human Touch. Springsteen was trying to make music about what was happening in his life, just like he always had. But he was rich, famous and happy now, and therefore much less relatable to the people he was writing for. Worse, he was doing it without the cast that made his music so special in the first place. 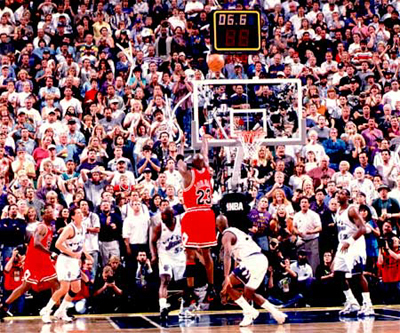 Like Jordan, his confidence in success was so high that he failed to consider the idea that things might not work out. Things didn’t work out for either man, at least not totally. Jordan rebuilt himself as a baseball player but greatly struggled at first and ultimately fell short of his major league goal. 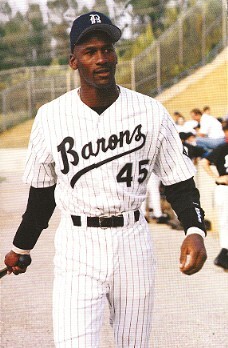 The constant media attention given to him as he played in Double A Birmingham couldn’t have helped, but Jordan committed himself and was improving when the 1994 MLB players strike derailed his journey. Springsteen disappeared again from the limelight after the critical tar-and-feathering of his newest albums, emerging to win an Academy Award for the song Streets of Philadelphia in 1994 and to record a successful folk album, The Ghost of Tom Joad, in 1995. Both men had largely failed in their new careers, something that neither anticipated, or knew how to deal with. Their experiments had not filled the holes they had imagined for themselves; rather it had led them to the realization of what they had left in the first place. Their confidence in their respective abilities was something that had always been absolute; now that confidence had been shaken. This was when something strange happened. Both men made the choice that everyone in the world wanted them to make so badly. For the first time, rather than going against the grain and doing their own thing, both men gave the people what they wanted. Both began tentatively. Jordan returned mid-season to a Bulls team that was decent without him but struggling. Despite dropping a 50 point game at Madison Square Garden against the Knicks, the Bulls were eventually bounced from the playoffs against the young and hungry Orlando Magic and the whispers began again: ‘Has Jordan lost it? Is he too old?’ His team mates didn’t think so but Jordan needed to get back in basketball shape. He spent the off-season brutalizing his body and again building his muscle up so that he could withstand the daily pounding he took in the NBA. His legendary competitiveness took the loss to Orlando and the questioning of the media as the ultimate slight; he came back the next season and led the 1995-96 Bulls to a 72-10 record, the all-time single season wins mark. They also won the first of another three-peat of championships, besting the Magic along the way and eviscerating the Seattle Supersonics in the finals. Jordan won league MVP and was first team all-defence. He was back. Time heals all wounds. The E Street Band back together. Springsteen got the band back together to record four songs for his greatest hits release in 1995. There is documentary footage of these recording sessions and upon re-watching, you can see the hurt in the faces of the band. They’re business like and they’re present but the love and friendship that was always such a staple of the band is lacking. Nobody is smiling. Springsteen had hurt these men. In collective interviews, none will disparage him for breaking up the band, always citing that he had the right to do whatever he wanted and making sure to mention he was more than generous, paying each band member a rumored 2 million dollars upon the split. But the unwritten hurt is still there. In his biography ‘Big Man’, Clarence Clemons likens seeing Springsteen onstage with his other band to ‘like seeing your girl with another man, man’. This led to Springsteen’s apology, and one of the truest, most heartfelt songs he ever recorded, with the band or otherwise. Applied to the situation of the band, the words speak for themselves. If you watch it here, you can see how it builds. 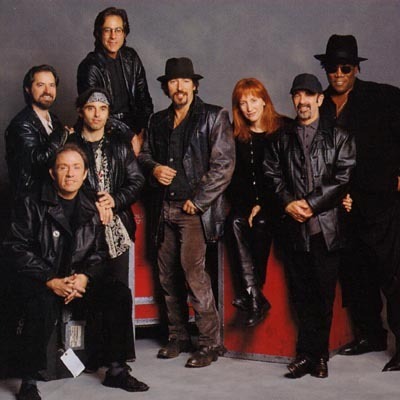 Springsteen begins alone and slowly each member of the band comes in, eventually culminating with a muted intertwining of Springsteen’s gruff harmonica and Clemons gentle, beautiful saxophone. And at the end, Bruce laughs, and shows that passion, that love, that soul that was missing. And with that, he was back. Four years later, after grueling rehearsals, the E-Street Band made their triumphant reunion tour, selling out arenas all over the world. Springsteen, on stage, would now preach the love, faith and brotherhood, constantly speaking about the special bond between himself and his band, and the bond between themselves and the audience. Springsteen learned to trust other people but also learned to trust in himself. Playing with his new band, he had missed the natural chemistry; it was something he had taken for granted. In response to a question about the famous quote mentioned at the beginning of this piece, he stated ‘that was true at the time. But the two best days in my life, I can now say, were the day I picked up the guitar and the day I learned how to put the guitar down’. Springsteen recognized life outside music, and that helped him better appreciate the talent, skill and commitment of the people in his band and in his life. Jordan too was different when he came back. Failing at baseball had given him empathy for his teammates that had been missing previously. He had a better insight now as to how hard a sport could be for some people. Having succeeded at every level of basketball before, Jordan had been a ruthless teammate, expecting the level of perfection from everyone else that he himself produced. The new Jordan was still driven, but he carried his team, rather than berating them. He worked with his team mates, as opposed to working around them. Like Springsteen, he trusted totally and that trust was rewarded. Three more championships, two MVP awards and eternal glory: being known as the best to ever play the game. With teammates on hand, Jordan in victory. This is where the parallel ends. Springsteen has embarked on various musical endeavours since his return, with varying critical success but still with massive and unwavering popularity. Jordan retired and un-retired, was fired as an executive with the Washington Wizards and is currently in the midst of a widely criticized run as the owner of the lowly Charlotte Bobcats. The men are at different places in their lives; Springsteen still doing what he loves, Jordan forced to do something else and struggling mightily. Their stories will likely never link so closely again. But for a while, these two enigmatic figures, two of the most famous and popular men in the world, followed a similar path, learned similar lessons and had similar defeats and glories.